One of the most difficult decisions John Labrie has ever made came as a result of the 62-year-old plumbing contractor failing to act his age while making a routine run to a local supply shop one day last October. 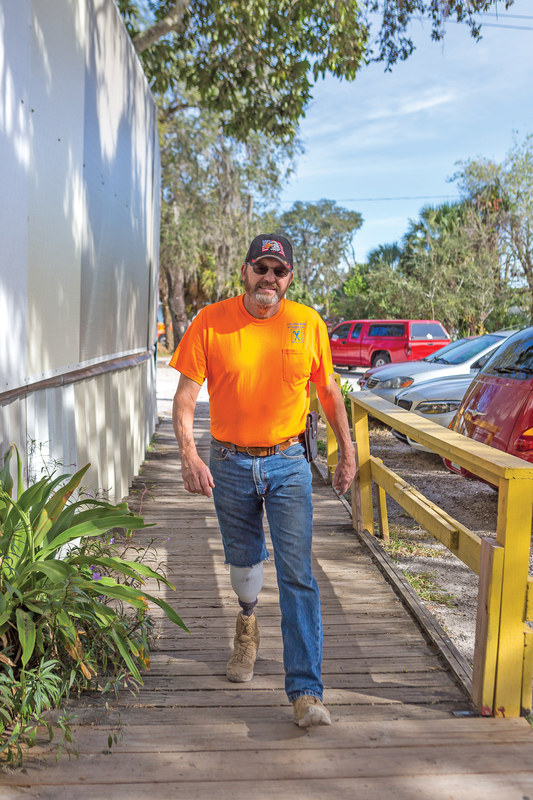 That incident was the beginning of a long but failed healing process that first began to go awry when John’s midfoot fusion surgery left him with a painful bone spur and a foot ulcer the size of a quarter. John was advised to stay off his feet until the ulcer shrunk to the size of a dime. But instead of shrinking, the ulcer grew larger and became so infected that doctors could not guarantee that even an eight-week, in-hospital regimen of antibiotics would heal it. It was then that John, eager to get back to work and thinking he was likely going to lose the foot anyway, made the difficult decision to have doctors surgically remove his right leg below the knee. “The thing is, there was no guarantee that the antibiotic treatments were going to work,” John relates. “And by then, another ulcer had formed on the side of my foot. Not only that, but there’s a history of diabetes in my family. John left the hospital with a list of companies that could eventually fit him with a prosthetic leg. Based on location, he chose Sonlife Prosthetics and Orthotics, but he soon discovered that Sonlife stood out for reasons other than location. John had those discussions with David Goris, CPO, LPO, who specializes in designing, building and fitting prostheses based on each patient’s individual needs. In John’s case, those needs largely centered around his line of work. “John works at construction sites all day and is on his feet a lot, so we wanted to make him something that was lightweight and maneuverable, something that allowed him to move smoothly across uneven ground and get up and down ladders and stairs,” David reports. John received his prosthetic leg about two weeks after that meeting with David. Since then, he has adjusted to it very well. He estimates that he puts in about three miles a day of walking and running on the leg and has no issues with it. “I’m still a little slow going down ladders, but I can go up them without a problem, and I can pretty much run up and down stairs the way I used to as well,” John enthuses. “And boy, you should see me golf now. “I had the new leg for about two weeks the first time I went golfing again, and because I’m not raising my leg and my knee is locked in, I hit the ball straighter than I ever have before. I had just one slice that whole day.